Watching sports is the pastime of choice for many of us. If you can’t be there in person, the next best thing is to watch your favorite game live on television. Kodi users will be thrilled to know that the right addons make it easy to catch your favorite live sports. Everything from NCAA football to must-see boxing and MMA events like UFC 232 Jones vs. Gustafsson is easily available through Kodi. Addons such as DAZN, Fox Sports Go, PlayStation Vue, SportsDevil, cCloud TV and more offer up great viewing experiences, but some of these are options you should avoid. 2019 is a great time to pick up your Motorcross addiction. The AMA is the single largest provider for Motorcross and Supercross sporting events. You can easily watch hundreds of Motorcross and Supercross events both live and on-demand using the AMA Pro Racing Kodi addon. 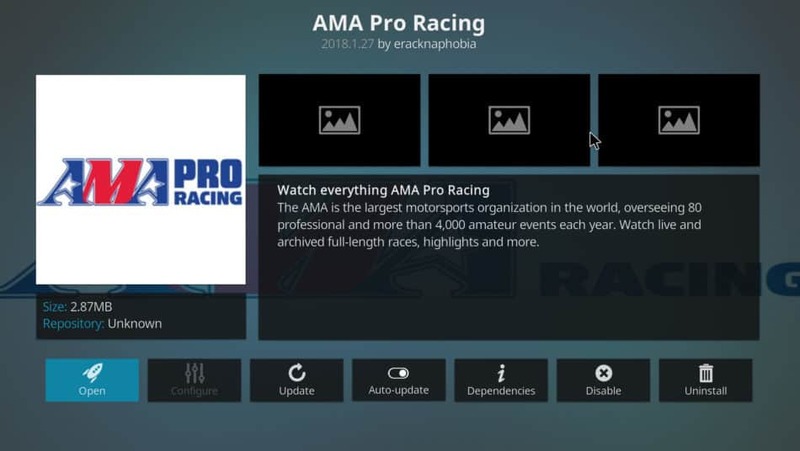 This addon is completely free to download, and also pulls content from the official AMA Pro Racing YouTube channel. You’ll be able to watch live events when available through the addon. Below, we’ll discuss some of the addons people are turning to sports, and some options you should avoid. See below for reviews and installation guides for the best Kodi sports add-ons available. Be wary with many sports Kodi addons. At this time of writing, the options we’ve recommended below provide several free and legal streaming options for Kodi users. However, some of the most popular addons access unofficial sports streams. At the bottom, we’ve laid out some commonly listed third-party addons, as well as explain what you need to know about these addons. Some of these addons offer up completely free sports streams. Others will require you to connect to a paid service. Most are geographically locked to specific locations, so you may need a VPN in order to access their streams. When you stream content through Kodi, your ISP can see everything you do. Due to recent changes in the law, your ISP can collect your data and sell it to third parties. Additionally, your ISP may throttle your streaming speeds. For sports streams, that means lower-quality video and buffering. If you’re trying to stream some content, you may also find that it’s blocked thanks to geographic content blocking. Many sites and services, especially for sports, block users from accessing content while outside of their regional service zones. A virtual private network, or VPN, can help you get around ISP monitoring, throttling, and streaming service location blocking. VPNs hide your true location and identity from sites you visit, and completely hide your streaming activity from your ISP or anyone else. The best option for Kodi users we’ve found IPVanish. We can confirm that IPVanish works with all Kodi add-ons we’ve tested and is very popular within the Kodi community. Better still, our readers get a 60% discount on the annual plan. If you want to to try an alternate provider you can find our full list here of recommended Kodi VPN services. 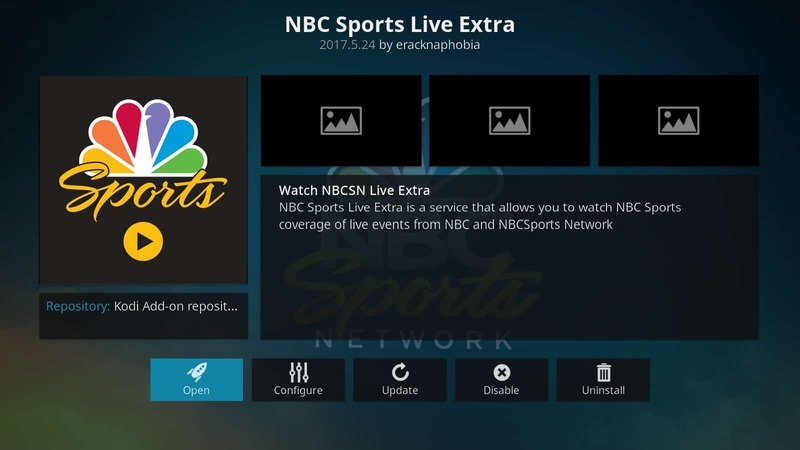 Each of these add-ons will allow you to watch live sports mainly by aggregating IPTV links from around the web. Many will also let you watch replays and other on-demand sports-related content. Even better, all of the options listed here are available in the Official Kodi Addon Repository, making them super easy to install and use even with Kodi installation. Pronounced “da zone”, DAZN is a British sports streaming service that has is now available in a handful of countries, such as Canada, Germany, Japan and more. The service offers a wide selection of popular sports such as NFL, NHL, motorsports, cycling, tennis, and others in most of the countries where it’s available. In the US, however, the service is a one-stop-shop for fighting sports, cutting out the high cost associated with fight sports Pay-Per-View. 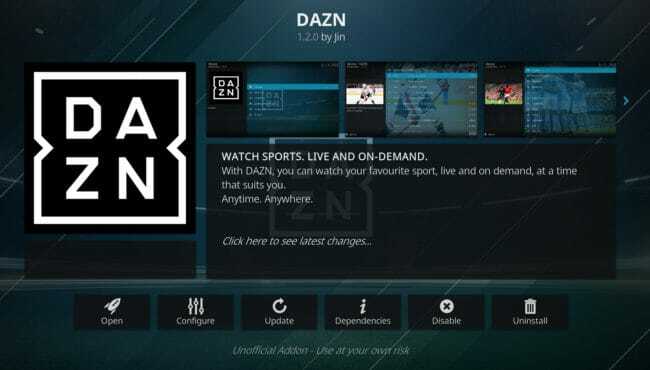 DAZN offers different content in each region where it’s available, but we’ve found that ExpressVPN works to get users into the Canadian version of the service. That means if you’re in the US and sign up for DAZN, you can expand your sports options, making DAZN one of the best sports options available. Popular: Can you watch McGregor vs Khabib on Kodi? If you’re using any subscription service that includes Fox Sports (such as PlayStation Vue, Sling TV, Fubo, or a regular cable subscription where Fox Sports is included), you can stream Fox Sports through Kodi. The Fox Sports Go add-on allows you to connect to your Fox Sports account by accessing your live tv subscription service and using those credentials. You can then stream both live games and on-demand content through the Fox Sports Go add-on. You can find this add-on easily through the Official Kodi Add-on Repository. The PS Vue Kodi add-on is the plugin that you can use to access your PlayStation Vue account. PlayStation Vue provides users with several dozen channels for $39.99 a month. That includes several of the most popular sports channels, such as Fox Sports and ESPN. 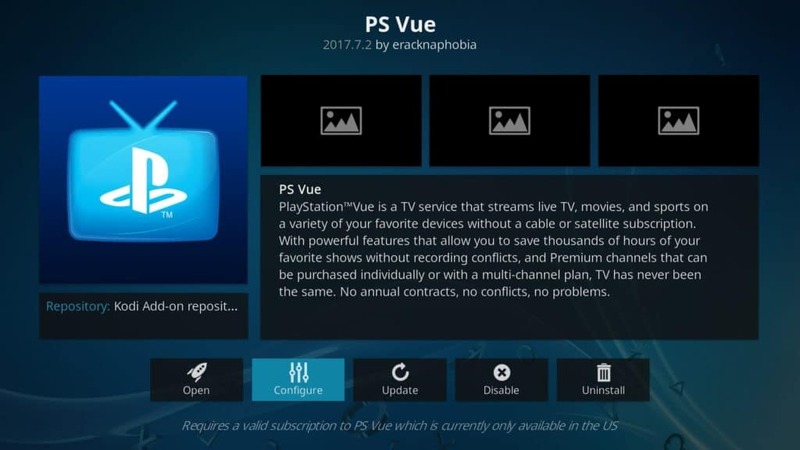 Available through the Official Kodi Add-on Repository, Kodi users can plug in their credentials into PS Vue and watch the content through Kodi. The settings can be accessed through a right-click on the add-on or a long press if you’re an Amazon Fire TV device. using The more favorable viewing experience through Kodi makes it more than worth the effort. 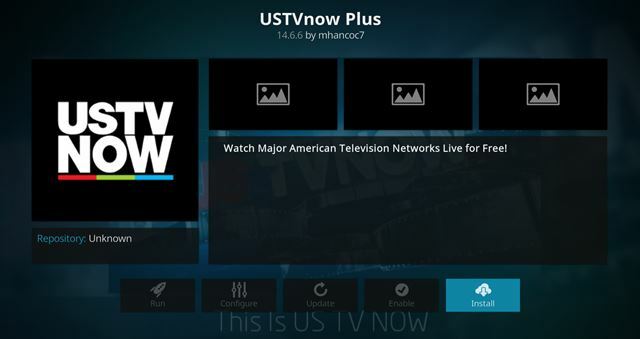 USTVnow add-on is a unique, paid service that offers a few free live channels from over-the-air networks. You can access ESPN if you decide to pay the $29/month price for an additional 21 channels through the service. This addon is primarily designed for US expats and military, but anyone can sign up. You may need a VPN in order to properly access the content, however. 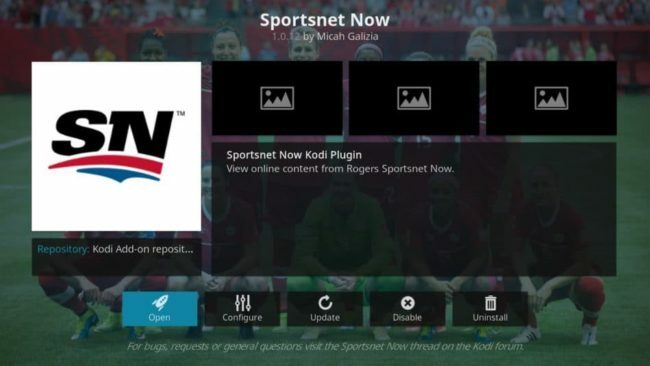 Sportsnet Now is a Canadian sports channel that offers up a load of great sports content. While a monthly subscription costs only around $25 a month, users can login and access their accounts through a very useful Kodi add-on. This add-on is available through the Official Kodi Add-on repository. Sportsnet offers up plenty of sports streams across a number of different categories, including MLB, NHL, NBA, and even some NFL matches. 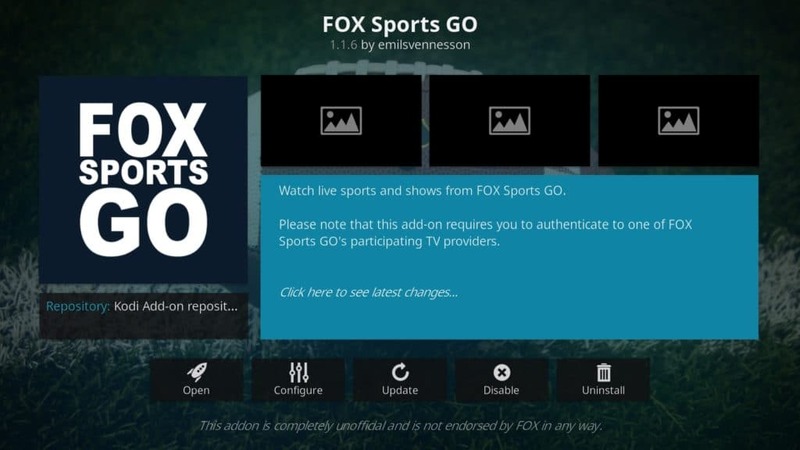 A free IPTV addon available through the official repository, Xumo has a number fo sports-related channels readily available to Kodi users, including channels for soccer, lacrosse, surfing, fishing, MMA, football, and more. Even better, the quality is almost always good. 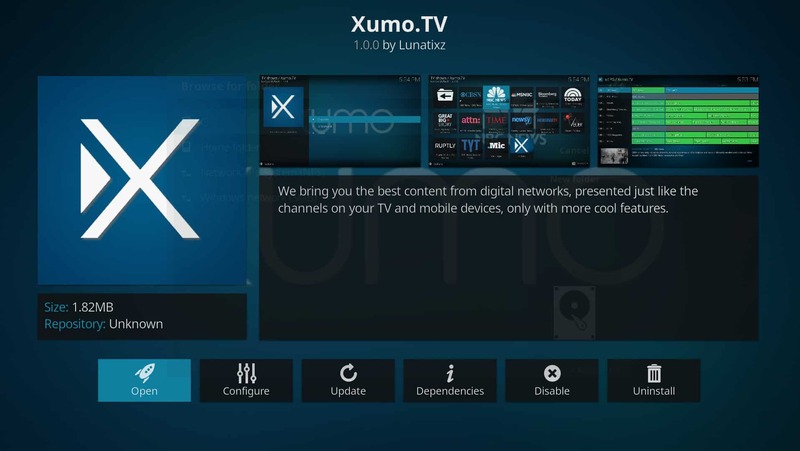 Like Xumo, Pluto TV provides a rather extensive and free list of TV channels. While you won’t find some of the most popular TV channel options through Pluto TV, you will find a large selection of news, entertainment, sports and more that are highly attractive offers for the simple price of $0. 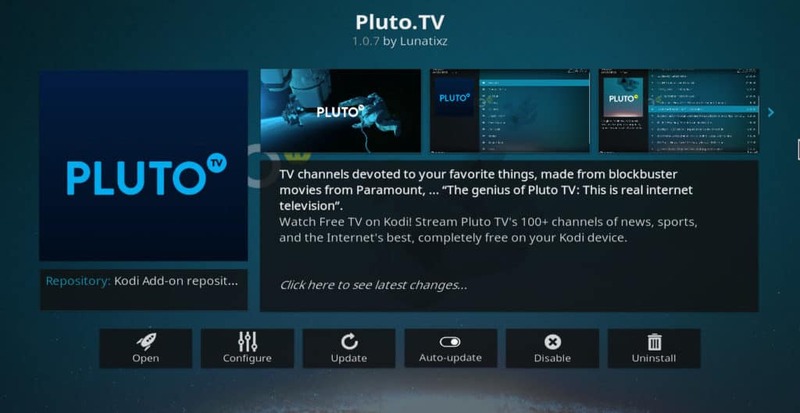 Unlike Xumo, which will play for free on Kodi without login credentials, you’ll need to create an account on Pluto and login through Kodi to get the streams. The account signup is free, however. The Canadian Broadcasting Company is a completely free TV service, available to anyone — in Canada, that is. 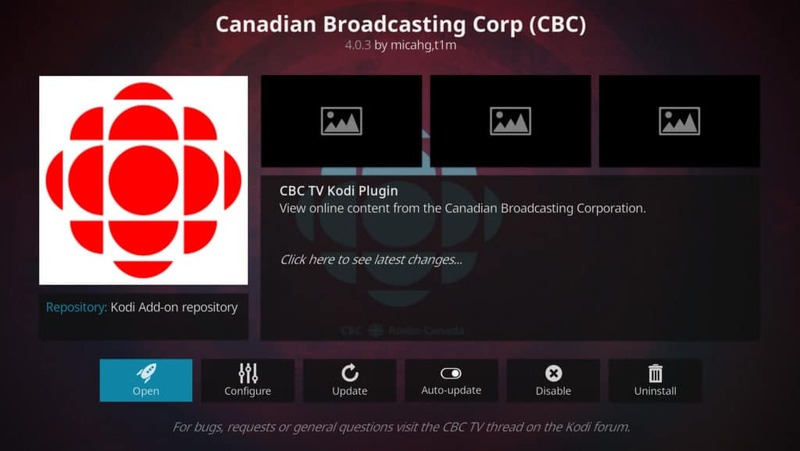 You can watch CBC’s free content both live and on-demand if you use the CBC Kodi addon. You’ll be able to watch some of the sports available through CBC live broadcasts as well, such as Hockey Night and the Olympics. If you’re not in Canada, you can still access CBC’s broadcast easily using a VPN connected to a Canadian server. Note that CBC’s live streams can vary depending on the location, so different VPN servers may result in different streams. 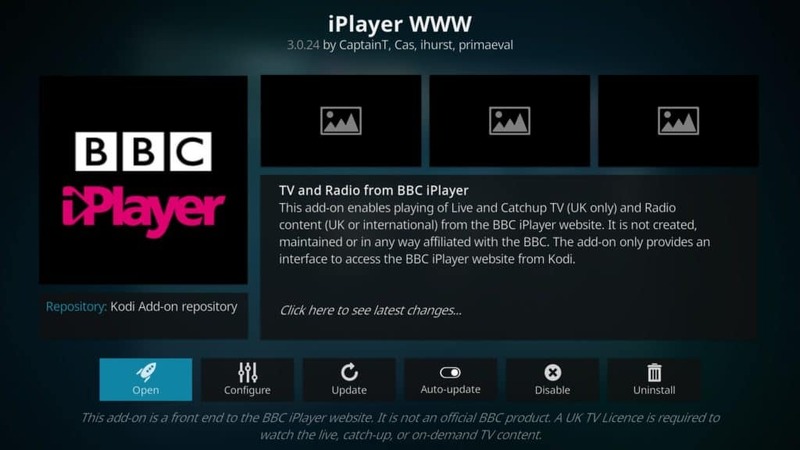 The BBC iPlayer Kodi addon goes by the name iPlayer WWW. You can download and install this addon from the official repository. The BBC iPlayer service is available to any UK resident with a TV License. Although the BBC is well-known for its high-quality dramas, documentaries, and comedies, you’ll also find a good amount of sports content live streaming from the service as well, and through Kodi. Many must-see worldwide sporting events make it right to the BBC, such as the World Cup or the Olympics, but also some other sports, including a few NFL games. If you’re traveling out of the UK, you can still get access to the iPlayer WWW addon through a VPN connected to a UK server. Like the BBC iPlayer, iTV is a mostly-free streaming service that offers a large load of channels for UK residents. A TV License is also required for iTV content, but the site also appears to allow users to load up streams and create an account with actually verifying TV License ownership. You can easily stream sports through iTV when available, as iTV often acquires the rights to stream sports throughout the year. You won’t find some of the top soccer matches, but you will find a large number of other sports through here. You can check iTV’s calendar on their website for more details. If you’re traveling outside of the UK, iTV’s content will be blocked whether you’re using it on the web, app, or Kodi. A VPN connected to a UK server will bypass that geographic block. 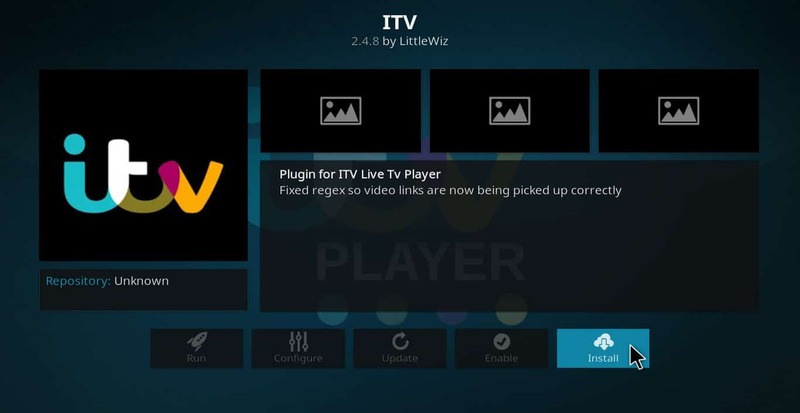 Unlike the other options on our list, iTV is not available through the Official Kodi Addon Repository. 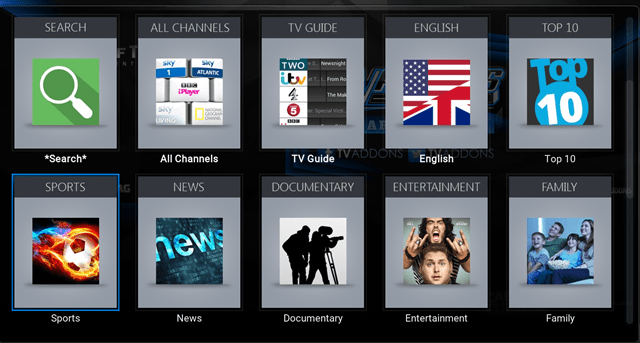 Find out more through our iTV Kodi addon installation guide. Tablo is an interesting option to add. This addon does not work as a standalone option. Instead, Tablo is a front-end for those who have digital antennas designed to pick up over-the-air TV signals. With a few adjustments, you can get Tablo up and running on your Kodi installation with no extra software. For cord-cutters, over-the-air TV is an emerging and increasingly popular option, considering there are more OTA digital channels available than ever before. 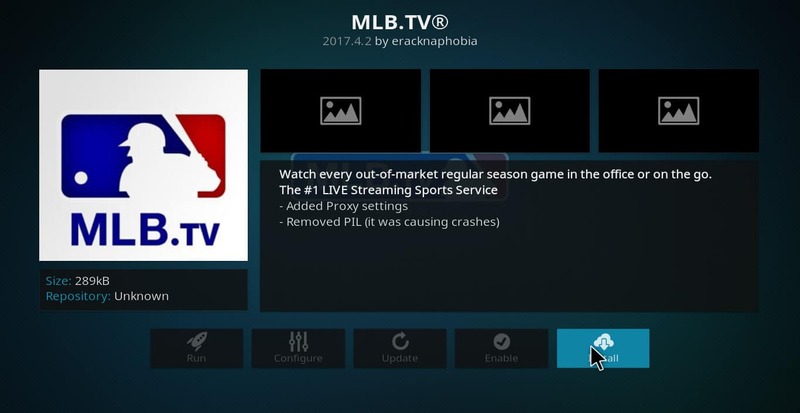 As many OTA broadcast networks regularly obtain and live stream sports content (such as MLB, NFL, NBA, and NCAA matches), using your Kodi Tablo app with a digital tuner and a few extra hardware solutions only make sense. 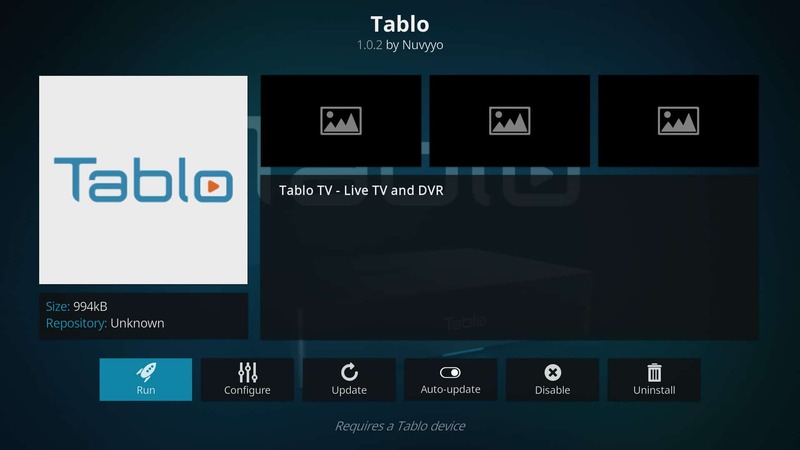 Note that Tablo is also a DVR, meaning you can save your live streams and access those from your Tablo device through Kodi. Learn more about how Tablo works and get a Tablo for yourself directly from the TabloTV website. If you can speak Swedish, or enjoy watching some of your sports for free despite language barriers, SVT Play and some of the other options below it are a great choice. SVT Play is the live streaming and on-demand option for SVT, the Swedish TV network. 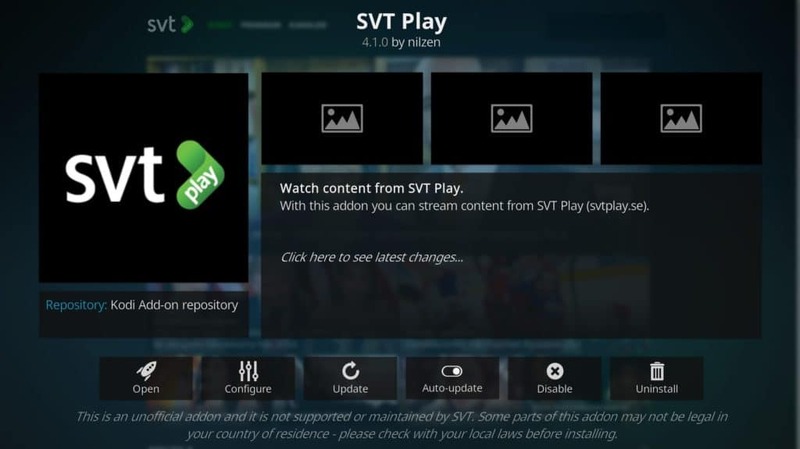 This option is completely free, and you can find a large handful of sports broadcasting through SVT Play throughout the year. SVT Play is locked to Sweden, so if you’re outside of that country, a VPN will be required to watch any streams. Germany has a good number of free TV networks and streaming options. 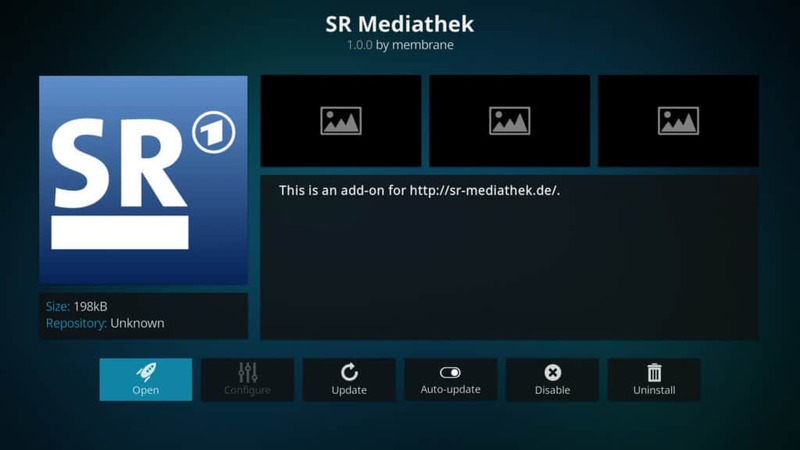 SR Mediathek is just one of them, but it’s also one with a very functional Kodi addon available. Through SR Mediathek, you’ll be able to watch a good amount of sports content, both live and on-demand, although we found it’s much easier to access on-demand content through here. This addon’s content is locked to Germany, so a VPN connected to a German server is required if you’re outside of that country. There are a large number of free TV stations in Austria. 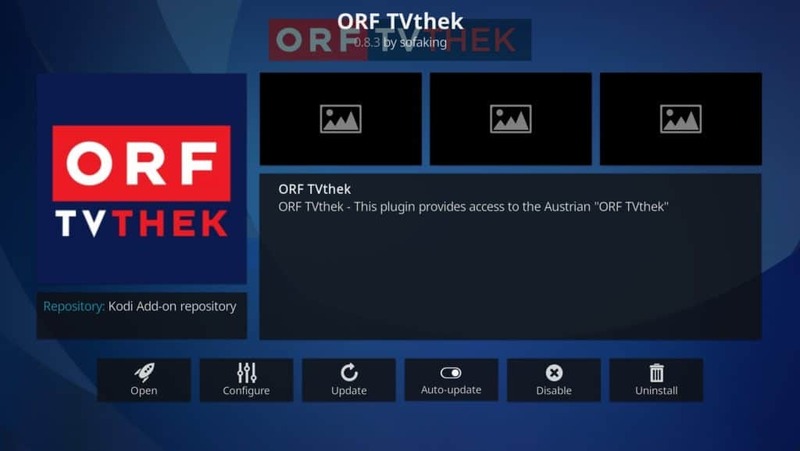 ORF TVthek is one of several online streaming options available to Austrians, providing a wealth of live TV and a good number of on-demand options. You can easily access all of it through the Kodi addon as well, including the rather large amount of sports programming available through the channel. ORF TVthek is geolocked to Austria. A VPN connected to a server in that country is required to view streams through Kodi or on the web. The NHL has one of the most complex set of streaming rights we’ve ever seen. Quite frankly, it’s a headache, as we discovered when researching our piece on how to watch the NHL Global Series. What we did find, however, was that using NHL TV’s streaming service is probably one of your best options to at least reduce the number of headaches you’ll get trying to find where to watch ice hockey. Once you’ve signed up, you can also reduce that stress further by watching through Kodi. Kodi’s interface will streamline the process for you, making it easier to navigate through the NHL’s content. 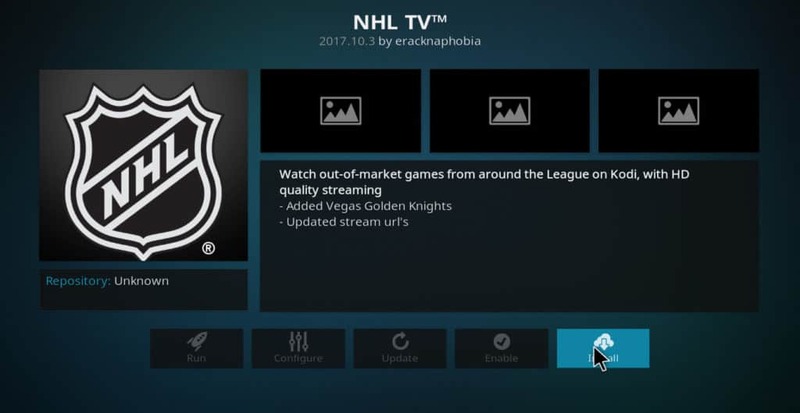 If you’re not into paying for the service, however, you can still get some free content through the service and through Kodi, including game recaps and highlights, as well as full streams of classic games from NHL history. NHL TV is geolocked to the US. Additionally, signup requires US payment information. However, you can use a VPN to access the free content from anywhere. NBC Sports is home to a huge number of must-see sports. Most people think ESPN has all of the games they want to see, but NBC actually acquires a good number of streaming rights for sporting events, including Nascar, Premier League, and golf. You’ll need a paid account before using this service, and you’ll also need to activate your device (the operating system or streaming device) to use it on Kodi. There is, however, some free content available in the “Highlights” section. NBC Sports Live Extra is only available for US residents and requires a US payment method for those signing up. The free highlights can be viewed by anyone bypassing the geographic content blocking, however. 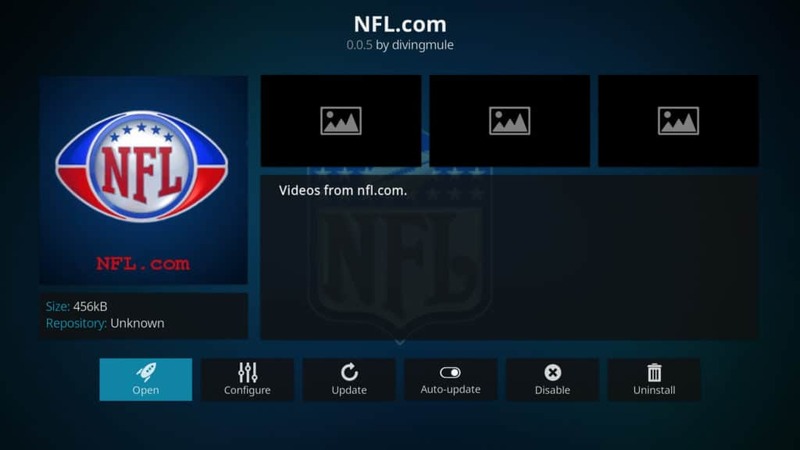 The NFL ‘s website has a large amount of content freely available online Seeing as this is somewhat easy to scrape, there’s a Kodi addon available for watching content from NFL.com. Without paying a dime, there are hundreds of short clips available from different games. You can even use the “Teams” menu to watch different game highlights and clips separated by your favorite teams. 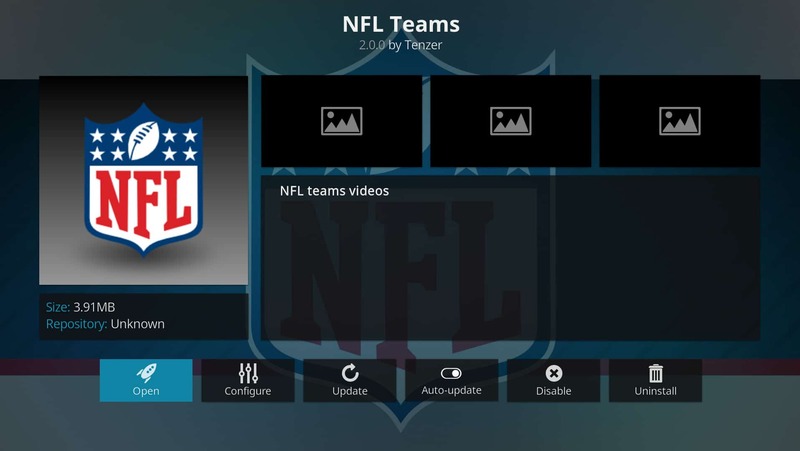 If you want to immerse yourself in content from each NFL team, the NFL Teams Kodi addon is definitely a must-have. This addon pulls from a large number of resources to provide bite-sized content related to each NFL team. You’ll find videos on everything from training camps to behind-the-scenes clips following individual players. You’ll also get game highlights, although you won’t get full games through this addon. As with the NFL, the MLB has its own streaming service that lets you get the games you want, especially if you’re looking for single-team games. You’ll need to sign up for a paid account to get the most out of the Kodi addon, but you can get short 1-2 minute highlights of different games using the “Yesterday’s Game’s” section of the addon. The MLB is pretty strict about its geographic content blocking, applying those rules even to US-based subscribers who are outside of different regions serving different teams. A VPN is a good idea for anyone using this service to get past the rather hefty blocks the MLB puts in place. That said, an MLB.tv account is only available to US residents with US-based payment methods. 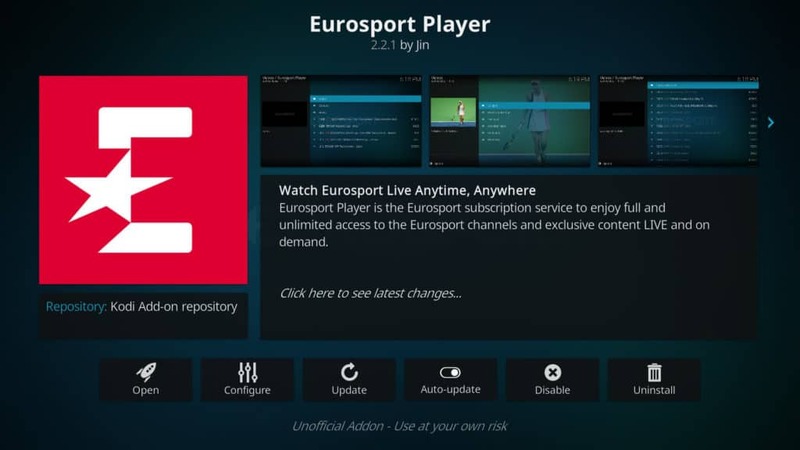 You’ll need a subscription to the Eurosport Player service to use this addon. That said, if you’re a subscriber and want to make use of the friendlier UI available through Kodi, this is a good addon to install. This is one we’ve recommend in different reviews before. 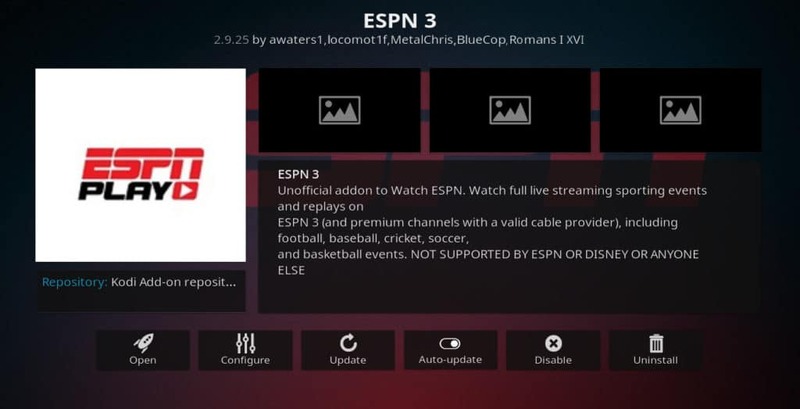 The ESPN Player Kodi addon is designed for those who are paying for access to several of ESPN’s services. The Player addon scrapes those options and displays them in Kodi for you. 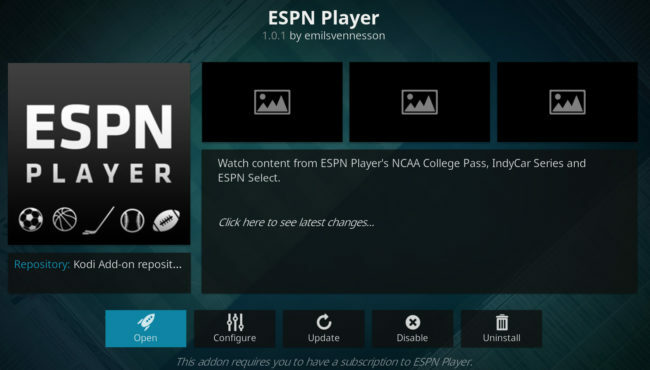 If you don’t have an ESPN Player account, you’ll need to sign up for one and enter your login information in the addon settings before you can use it. At one time, ESPN 3 was ESPN’s official streaming service. It’s now been overtaken (and merged, perhaps) into their ESPN+ service. However, you can still access streams through this addon and if you had an ESPN 3 account. You’ll need to authenticate your account and device on the addon to get most of the features, including full live games. However, without an account, you can still watch some free content, such as replays and highlights of every sport ESPN covers. Geolocking is in place, so you’ll need a VPN if you’re outside of the US to watch any of the free or paid content. 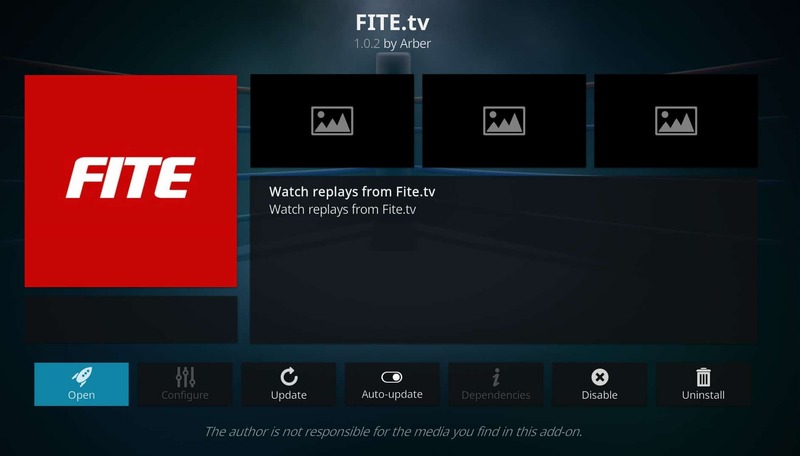 A free streaming service that also offers paid Pay-Per-View streams, Fite.tv is a must-have addon for sports fans. This addon connects directly to the website of the same name. You’ll find hours of fight sports to watch, with a lot of content available from around the world and covering a wide selection of fight sports. This addon is available on the developer’s GitHub page. Dirt bike racing becomes far easier to watch live and on-demand with the AMA Pro Racing Kodi addon. This addon offers access to hundreds of events on-demand, as well as live events when they become available. You’ll find this addon for free from the official Kodi addon repository. The unofficial Kodi add-ons are often used by a large number of Kodi users. However, we do not recommend these add-ons due to the way they pirate sports streams. With the exception of USTVNow listed above, any add-on offering “free” streams for live sports is likely rebroadcasting that content without permission. What is it? Star Tec is an on-demand and IPTV Kodi addon that pulls in content for a large variety of channels. These streams are obtained through websites that access the content from sometimes dubious sources. Why should you avoid it? As an IPTV add-on, none of the content offered through Good Fellas is offered legally. This add-on provides only pirated streams and lacks official rebroadcasting rights from the copyright holders. For that reason, we do not recommend users turn to Goodfellas for any streaming purposes. What is it? cCloud TV is known for giving Kodi users access to several types of content. Sports isn’t excluded. This addon is laid out in such a way as to make it easy to find different types of live TV streams scraped from a number of different online sources. Why should you avoid it? cCloud TV has some limited legal options. These are specifically limited to countries that do not limit rebroadcasting. However, the most popular sports streams, such as those from the US, UK, and Canada, are not rebroadcast legally through here. We do not recommend cCloud TV for Kodi users, as this add-on focuses more specifically on pirated streaming. What is it? 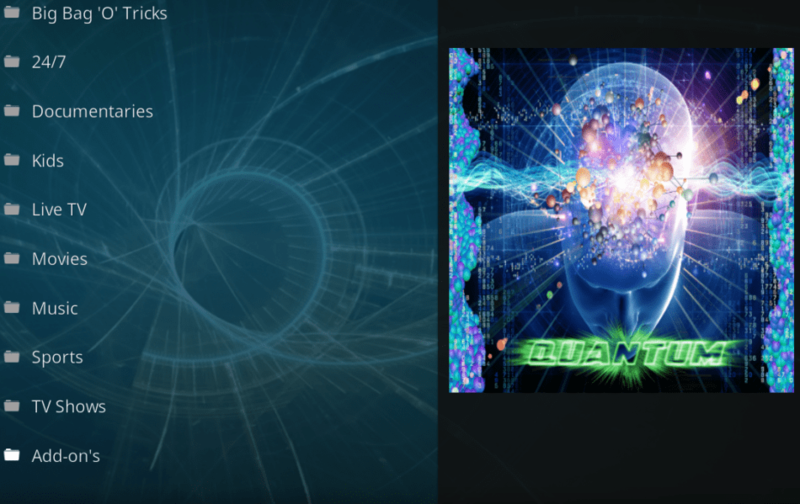 Quantum is a large Kodi add-on that is more of a combination of different add-ons. The developers behind Quantum grab up other add-ons that have lost their developer support. Most streaming in Quantum is live TV, although the add-on does utilize on-demand streaming. Why should you avoid it? Quantum suffers from the same problem as the other unofficial add-ons listed above. Some legal options may exist here, but Quantum specializes in pirated streaming. Few, if any, streams available in Quantum are broadcast with proper rebroadcasting rights. For this reason, we do not recommend Quantum. Other, legal Kodi sports add-ons in this guide provide a better experience. What is it? 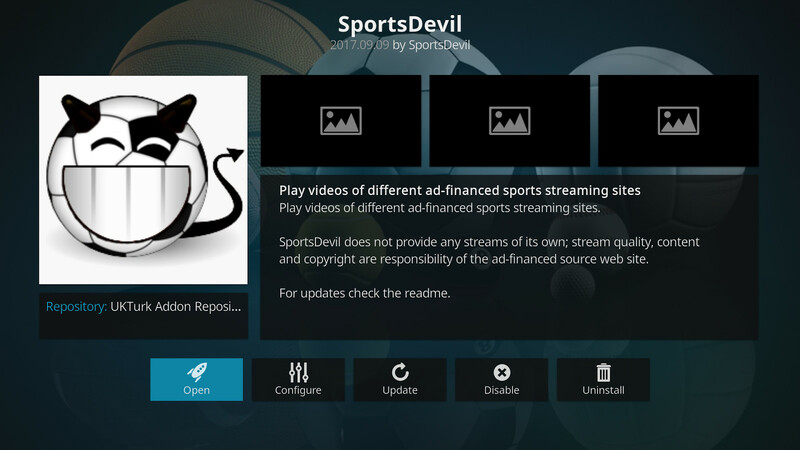 SportsDevil is an addon that scrapes the web for sports streams and offers those streams up to Kodi users. It’s not common for Kodi users to rely on SportsDevil as a standalone addon. Instead, it’s often used as a dependency for other addons. Why should you avoid it? Simply put, SportsDevil does not access many legally-available streams. Some of its streams may be legal and offered through places like YouTube, but the majority are not. We do not recommend SportsDevil or any addons that use SportsDevil as a dependency. I subscribed to iPVanish. I was still unable to watch BBC iPlayer when out of UK even though I used the scramble option. iPVanish staff were unable to help and I was refunded. I’m sorry to hear that iPVanish didn’t work for you. Here are some other VPN options for watching BBC iPlayer: https://www.comparitech.com/blog/vpn-privacy/best-bbc-iplayer-vpn/ . I subscribed to iPVanish. It was not able to conceal the country I was in and I was unable to watch BBC iPlayer from abroad. IPVanish staff were unable to help and I was refunded. Having to pay a monthly subscription kind of defeats the purpose of having Kodi. Having to pay a monthly subscription fee defeats the purpose of having to pirate content. There is nothing about Kodi that is illegal. It’s like Android. Legal to distribute but what users do with it could be illegal. Do some research man.